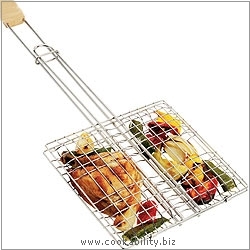 A chrome barbecue grill with two cooking sections, perfect for steaks, chicken joints and vegetables etc. Easy to hold and stay cool wooden handle. Locking clamp prevents inadvertent opening.